Maybe it’s the couple inches of snow that fell Saturday night. 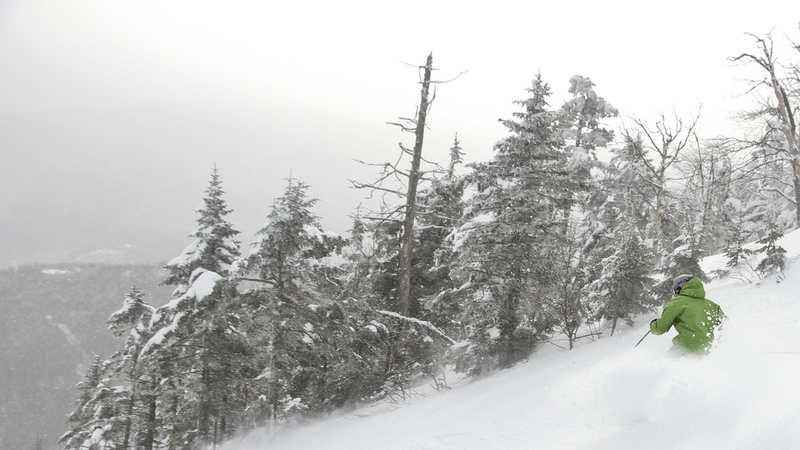 Maybe Gore’s wooded trails hold the snow a little better than Whiteface’s wider, steeper trails. Maybe it’s just being at my home mountain where I know the terrain better. Whatever the reason, the skiing at Gore on Sunday was a notch better than the day before at Whiteface. And for at least the third or fourth time this winter, I‘m declaring Sunday one of the best ski days of the year. With a season pass that's good at both Gore and Whiteface, you'd think I'd get up to Whiteface more often, but the truth is that the last time I skied at Whiteface was three years ago, before the new Lookout Mountain terrain came online. But when 14 inches of new snow coincided with a kid-less overnight visit to Lake Placid, the lifts at Whiteface trumped our nordic skiing options for Saturday. How big is your adventure? We had the chance for a quick overnight visit to the Lake Placid area, so after a semi-white knuckle drive through the tail end of Friday's snow storm, we arrived in time to head over to the Dewey Mountain cross-country ski center just outside of Saranac Lake for one of their Friday Night Ski Jams. We woke up this morning to snow coming down at 1 to 2 inches per hour, and I wanted to get out on my cross country skis before the snow got too deep. I've been out on the Kalabus-Perry trail a few more times on skis and snowshoes since I wrote about it last month, and this morning I made a quick circuit past some interesting terrain that the K-P accesses. Since it's the February vacation week, we take a break from our usual Wednesday telemark nights at West Mountain, but I had promised Daniel that the two of us would go night skiing this week, so he and I headed over to Willard Mountain for a few hours this afternoon and evening. The words "firm and fast" have not been part of my skiing vocabulary for most of the winter, but they are back in for this weekend. In all fairness, conditions today were much better than I had expected following Friday's thaw and flash freeze. It’s too bad that our great stretch of winter weather is being interrupted this week with mild temperatures that will push the 50-degree mark all the way up through ski country tomorrow. The good news is that the warm-up will be brief, and won’t be accompanied by any significant base-destroying rain.. I know you were expecting a report from the Hickory Telemark Festival today. But today was the last day of Daniel's Mountain Adventure program at Gore, and we couldn't miss that. So we "endured" another day of peak snow conditions at Gore. Hickory Ski Center in Warrensburg will host its 4th annual Telemark Festival this Saturday, February 12. Besides Hickory's legendary terrain and natural snow, there will be demos, clinics and a "Tour de Trees." Once again a packed lodge and parking lot (high school racing) translated into near empty slopes. Maybe the cold (upper single digits by the time I headed home) kept people away, because only a handful of our usual telemark group showed up to ski. Snow earlier in the week has helped keep the slopes in very good shape, perhaps not as soft as other Wednesday nights this year but still very good. Too cold and too few skiers for any pictures other than this view of the lower slope as I headed in at the end of the night. Sunday afternoon, with both kids in tow, I had the chance to check out a small, local ski area that you’ve probably never heard of, even though it’s been in continuous operation for nearly 75 years. 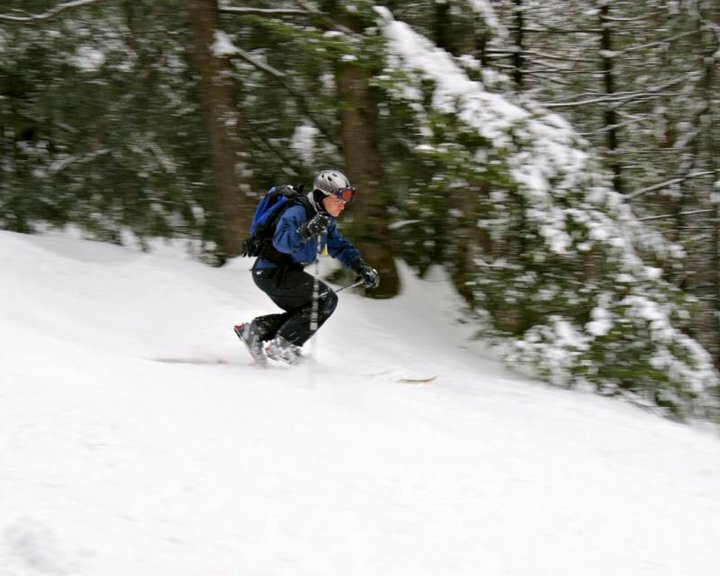 Ski Venture is a private club with its own ski hill and rope tows located in Glenville, about half an hour southwest of Saratoga Springs. Though small (110-foot vertical drop), there is a surprising amount of variety among the half dozen or so trails. Interesting day. First, the weather: bluebird skies all morning, then dumping snow an inch an hour by early afternoon. Second: got my first taste of the Ski Bowl and its interconnect with the main mountain. More on that later. But best of all, superb snow conditions on the trails and in the woods that made today perhaps my best day on the mountain so far this season. Beautiful morning, looking up at Rumor. I had been meaning to get back to Willard all season, ever since I interviewed owner and GM Chic Wilson back in November. With our kids home for a snow day, today seemed like the perfect opportunity to head over for a family ski day.